Thanks to Footballville Nation we finally have a 7 on 7 ball game to call our own. The Make a Play 7v7 tournament has touched down in Lee County Florida. Most football players know the need to practice, train, and compete doesn’t end with the season. Each Spring players seek another opportunity to evolve their football game. 7 on 7 has become the answer to filling that void. In the last decade, 7v7 or 7 on 7 has grown from a fad to a necessity for skilled players in the youth sports arena. Each Spring, thousands of young athletes turn to 7v7 to improve their skills and give them an edge over their competition. Unfortunately, not all youth ballplayers have gotten to join in on the fun. Young athletes in cities that have yet to catch the wave of the 7v7 ball has been left out of the playing field……. until now. Thanks to Footballville we finally have a ball game. The Make a Play 7v7 tournament has touched down in Lee County. The competition was fierce as teams from across South Florida vied for an opportunity to qualify for a national championship. The tournament was open to teams from 10u to Varsity and each team came to win. However, this was bigger than deciding who would take it all. 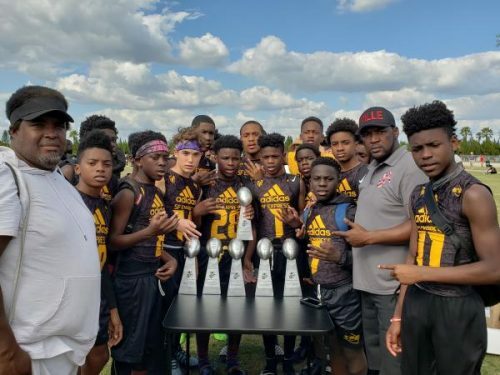 This tournament brought a new element to 7v7 in the Lee County area. This was the first time a 7v7 event of this caliber was brought to the area. “We’ve had a few teams play here and there, but not like this,” said a parent attending the event. Make a Play introduced All-star 7v7 to an area that had mostly only had a few high school teams. This is significant being that the most highly recruited areas in the nation rely on 7v7 to polish the skills of their most coveted players. It makes players more competitive, enhances their skills and contributes to their success in the field. Fortunately, even though it was their first time in the area, it won’t be the last. Make a Play returns to the Lehigh High School on April 13, May 4, and May 25. So if you didn’t make it this time, you still have a chance to get in on the action.